Bob Gray created a delightful watercolor workshop for a merry band of enthusiastic artists. With his splashy watercolors and creative spirit, he led the artists down a creative path within an hours time. 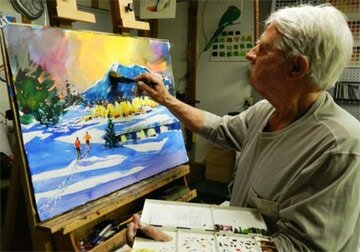 Bob encouraged everyone to enjoy the moment and not be trapped by the fear of not having a perfect painting. He also advised everyone not to continue trying to fix a painting. Rather, wait a few days and look at it with fresh eyes. You may find you love it. Robert conducts watercolor and acrylic workshops throughout the Denver area, Palmer Lake, Colorado and taught in Green Valley, Arizona. His paintings are located in several foreign countries and corporate collections.